Leila Bashir is a literacy campaigner, who has devoted her working life to the empowerment of women through communication and education. Born in Sudan, she followed her dream of life-long learning, fighting against the odds of civil conflict, displacement and gender inequality. Leila is now a lead trainer of the REFLECT (Regeneration Frierean Literacy through Empowering Community Techniques) literacy program, which is known in Arabic as “Learn for Life” and is an approach that transforms illiterate women into community activists, fighting injustice and inequality through literacy and social action. 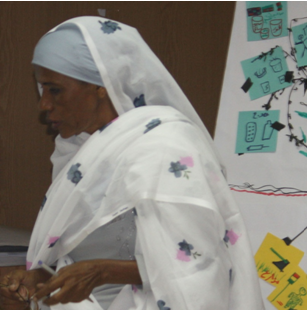 Leila has spent over thirty years teaching communities of women to take control of their lives through literacy. She has touched thousands of women’s lives in some of the poorest parts of the world, either directly or indirectly through her passion, commitment and relentless determination to impart her knowledge. For the many who have had the privilege to work with her, she is humble, kind, softly spoken and an inspiration. For those who have yet to work with Leila, she will change their lives for the better.